Plants dark to yellowish-brown, up to 35 cm tall, comprising several branched, strap–shaped blades with distinct, lighter-coloured midrib; attached by holdfast of matted rhizoids. Blades 12-22 mm wide, dichotomously branched, distally with axes arising from midrib; margins smooth to lacerate; blade surface smooth, becoming rugose in fertile areas; lines of hair tufts oriented perpendicular to midrib creating lighter-coloured striations across blades. Blade wings up to 170 µm thick, comprising 2 layers of cortical cells and 2-3 layers of medullary cells; midrib up to 20 cell layers thick. Sporangia associated with hair tufts, in oval sori, not embedded in cortex. Gametangia not seen. Further details in Tronchin & De Clerck (2005). Epilithic in rock pools, and lower eulittoral to subtidal zones to 30 m depth. Recorded from Port Alfred to northern Kwazulu-Natal (39-58). World distribution: Also recorded from Mozambique and Oman (Guiry & Guiry 2012). Type locality: Port Natal (Durban), Kwazulu-Natal (Silva et al 1996). 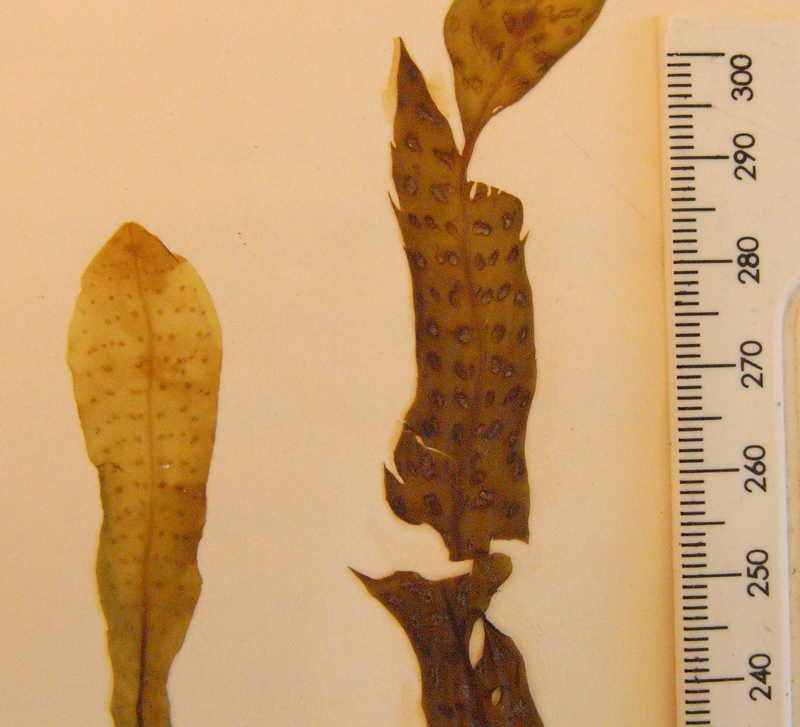 Note: We have specimens from De Hoop and Tsitsikamma that look very similar to D. macrocarpa, but the blades are too thin (too few cell layers). They and some unnamed specimens in BOL do not completely fit the descriptions of either D ligulata or D. macrocarpa (also see notes in Silva et al. 1996). This group in South Africa clearly needs molecular study. Dictyopteris macrocarpa, with characterisits lines of hairs on blade (KZN specimen). 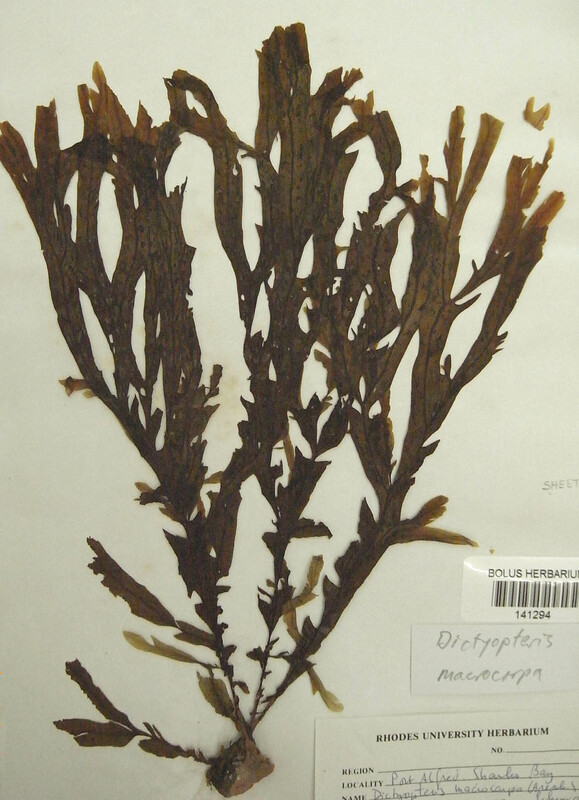 Dictyopteris macrocarpa, Port Alfred specimen (BOL). 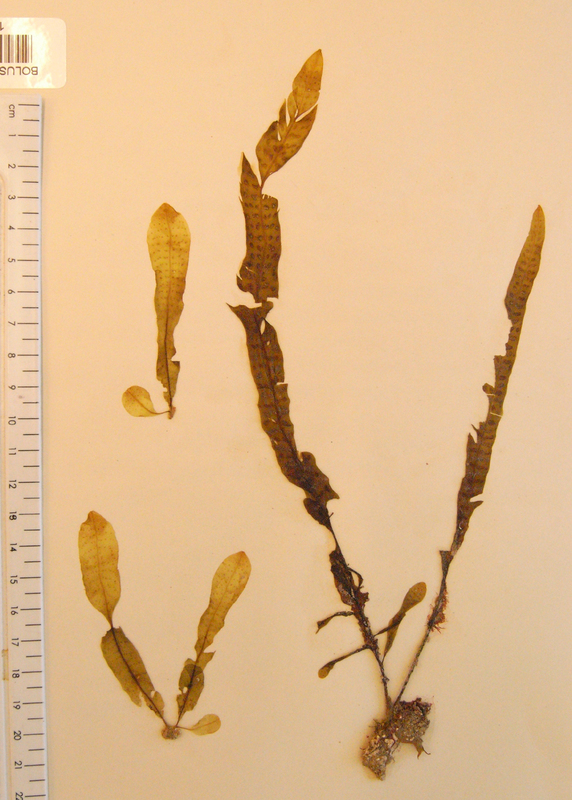 Dictyopteris macrocarpa, Kosi Bay, KZN (BOL). Dictyopteris macrocarpa, Kosi Bay, KZN (BOL), showing horizontal lines of sori and hairs. Guiry, M.D. & Guiry, G.M. 2012. AlgaeBase. World-wide electronic publication, National University of Ireland, Galway. 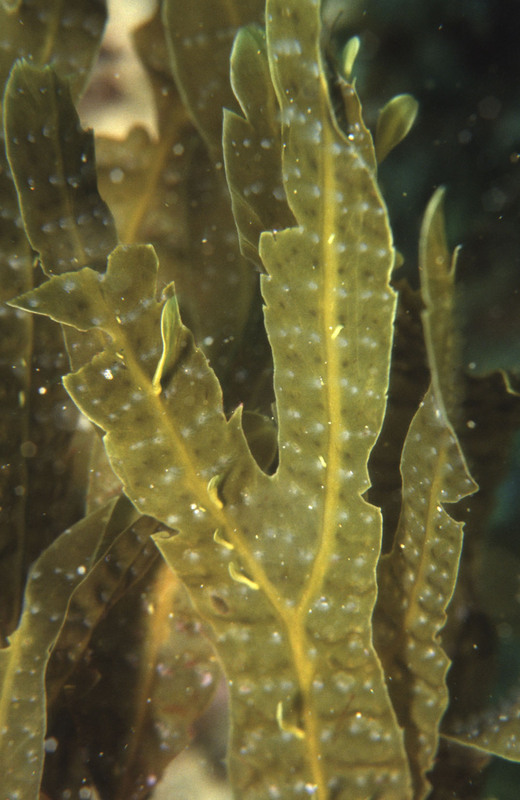 http://www.algaebase.org; searched January 2012. Schmidt, O.C. (1938). Beiträge zur Systematik der Phaeophyten I. Hedwigia 77: 213-230.